Dental inlays and onlays are restorations that are used to repair teeth that have mild to moderate tooth decay or cracking. These procedures are used when a person’s teeth are not damaged enough to require a crown. Inlays and onlays help you keep your normal tooth structure after decay and damage. They are known as “indirect fillings,” because they are made in a laboratory and bonded to the tooth on a subsequent visit. Eten Dental office in Bayside, NY is ready to help receive dental inlays and onlays. There are many benefits to dental inlays and onlays. Unlike fillings, they do not weaken the tooth structure. After you’ve received your inlay or onlay, your tooth will be stronger and able to bear between 50 to 75 percent more chewing force. If you need an old filling replaced, your dentist may recommend dental inlays and onlays. A dental inlay is closer to a filling, since it sits inside the top edges, or cusp tips, of the tooth. A dental onlay is a more extensive filling, extending over the cusps of the tooth and covering the entire chewing surface. Dental inlays are a step up from metal amalgam fillings with functional and cosmetic benefits. If you have a cavity, dental inlays repair the chewing surface of the tooth. Inlays are more durable than traditional composite or amalgam fillings. At Eten Dental, you have many options for the materials used in the inlays, including composite resin, colored porcelain or gold. Today’s inlays are available with material that matches your natural tooth color. If your metal fillings make you self-conscious, you should consider replacing them with natural inlays. Eten Dental is able to offer you procedures that will restore your confident smile. Dental inlays are created in a laboratory according to the exact specifications of the tooth. At your first visit, Dr. Hwang will remove the decayed portion of the tooth to create an impression and model of the tooth. This is sent to the laboratory, where they will make the inlay using the shade and material of your choice. If you are concerned about how your teeth will look while the inlay is being made, there is no need to worry. Eten Dental will give you a temporary filling while your permanent inlay is created. The temporary restoration protects your teeth and ensures that you can chew comfortably and safely. Once the inlay is complete, you will return to Eten Dental for a fitting. In some cases, the inlay can now be created in a single visit. New CEREC technology allows dentists to make same-day dental restorations. Our dentists may be able to mill your inlays on site. This benefits the patient, since you will not have to wait for your porcelain inlays to be made. We can create and cement them in place in just one visit. Traditionally, dentists used metal fillings. Metal fillings weaken the tooth, whereas porcelain inlays do not crack with hot and cold foods. With porcelain inlays from Eten Dental, the tooth retains a natural look and perfectly contours your gums. Dental onlays are considered indirect fillings because they perform the same role as fillings. However, onlays are stronger, they last longer and they fit better than traditional fillings. An onlay is usually created in a laboratory before it is bonded to a tooth. 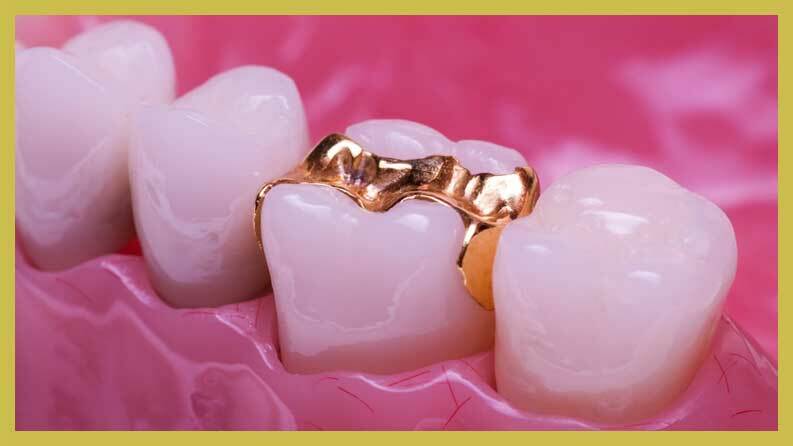 Dental onlays come in many different materials, such as gold, porcelain and resin. The materials work the same way but have a different appearances. Normally it takes two visits to complete an onlay. On the first visit, dentists from Eten Dental will take molded impressions of the teeth. These are sent to the laboratory so that a custom onlay can be crafted from the mold. The dentist will create a temporary onlay while you wait for the onlay to be professionally crafted. When you have your second visit, the dentist will remove the temporary onlay and install the permanent onlay. Eten Dental will examine you bite to make sure the onlays fit smoothly without any discomfort. Once the fit is perfect, the dentist will bond the dental onlay onto the tooth. Eten Dental can assist you in determining which material is best for your onlay. The location of the onlay will determine what materials should be used. 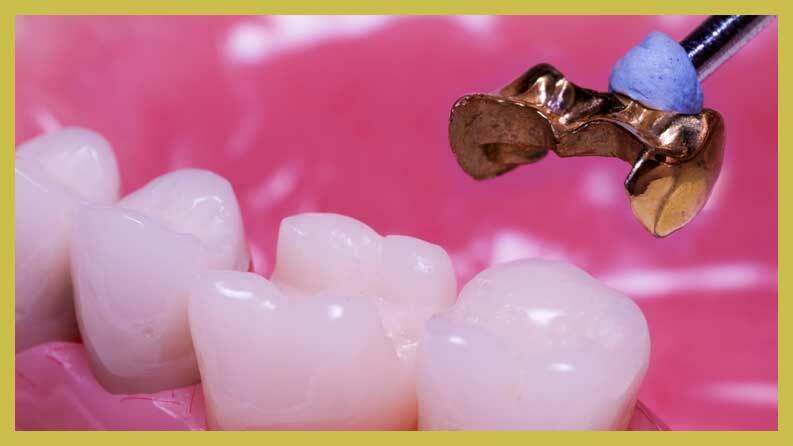 If you need an onlay on your back molar, gold is recommended. Resin materials are best for people who have a tendency to grind their teeth or for those with a misaligned bite. Porcelain is recommended for the smile lines. Natural Tooth Preservation: Preserving the natural healthy tooth is a priority at Eten Dental. Onlays allow the dentist to preserve healthy tooth structure and restore damage and decay. This promotes longevity. Color: Dental onlays do not get as discolored as resin fillings. Cleaning: Dental onlays are designed to fit perfectly with little maintenance. They are easier to clean than crowns. 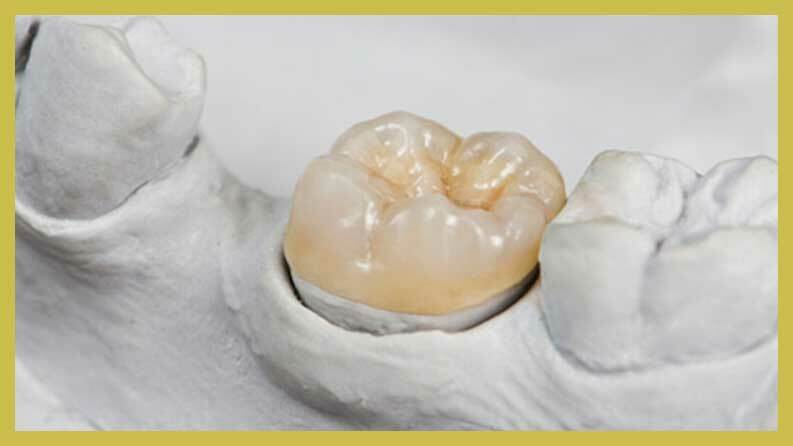 Size: Composite fillings have a tendency to shrink while they cure, whereas porcelain or gold onlays do not. Stability: Dental onlays are stable and often make a damaged tooth stronger. Since a dental onlay does not require the dentist to reshape the tooth, the onlay promotes strength and stability. A dental onlay is a less expensive alternative to a full crown. At Eten Dental, Dr. Hwang prepares to save as much healthy tooth as they can. The onlay is the best option for moderate or minimal tooth decay. To learn more about how inlays and onlays can improve your smile, contact Eten Dental today.